Provides assistance to those who have difficulty stepping over bathtub walls . 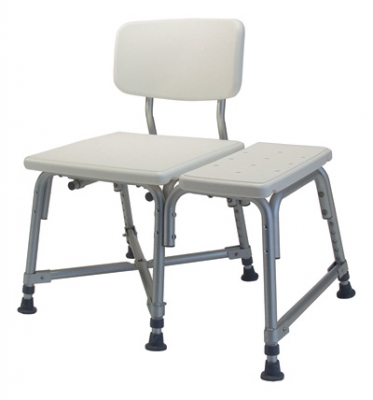 Durable blow-molded plastic bench and backrest provide a 600 lb. weight capacity . Drainage holes in seat minimize water build-up . Extra-deep seat provides added stability . Anodized aluminum frame is lightweight, durable and rust-resistant . Seat height is adjustable in 1" increments . Reversible back attachment to accommodate any bathroom . Attractive platinum grey color . Comes assembled with tool-free back attachment . Maximum Weight Capacity 600 lb - EVENLY DISTRIBUTED . Designed to meet the requirements of HCPCS code: EO248 . Lifetime limited warranty .